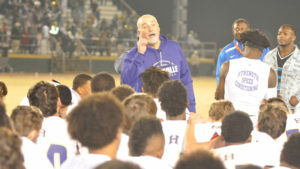 Hahnville’s run through the Class 5A playoffs and state runner-up finish brought a traditional football power back into the spotlight, and with that spotlight, the accolades keep on coming. The Tigers’ Anthony “Pooka” Williams was named the Outstanding Player of the LSWA’s Class 5A All-State team, while Hahnville head coach Nick Saltaformaggio was named 5A’s Coach of the Year. Another Tiger, Larry Dixon, also earned first-team honors on the All-State squad, as did Destrehan’s Macon Clark. Williams put together one of the truly elite seasons ever in 2017. He posted 3,108 rushing yards on 314 carries for an average of nearly 10 yards per carry and he scored 40 total touchdowns. 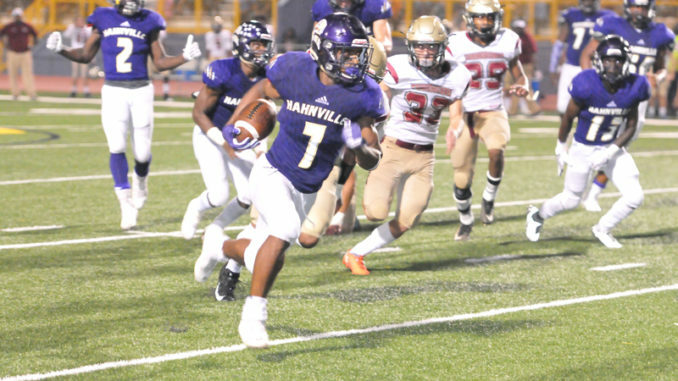 With Pooka as its centerpiece, the Hahnville rushing attack became the team’s unstoppable calling card this season, with even the state’s best defenses unable to completely slow it down, even with heavily stacked fronts. His postseason play vaulted him from a respected talent to perhaps the state’s player with the most buzz around his name at season’s end. He made 26 carries for 305 yards (vs. Denham Springs); 42 carries for 303 yards (at Ruston); 27 carries for 353 yards (vs. Covington); and 25 carries for 213 yards (at Acadiana) and 36 carries for 210 yards (vs. Zachary) despite playing through a high-ankle sprain suffered a week prior. 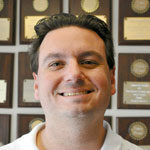 He scored 15 times over those four games, plus a game-winning two point conversion in overtime of the state semifinals. Williams was also named USA Today’s choice as Louisiana Offensive Player of the Year and part of its All-Louisiana team, which is chosen from all classifications. He officially signed in Kansas in December. 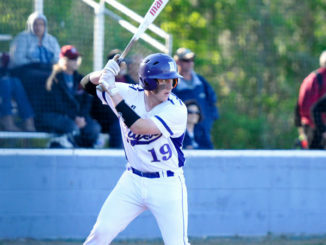 Saltaformaggio led Hahnville to a 12-3 record in his fourth season with the program, and with that a berth in the Class 5A state championship game. 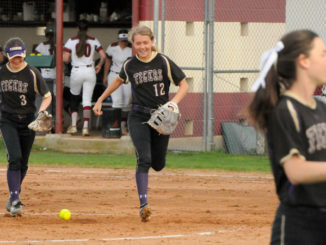 Hahnville defeated rival Destrehan this season and went unbeaten in district play. His teammate, Dixon, was a star on the offensive line that helped Williams stack up those numbers. 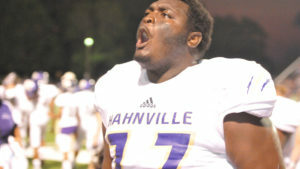 The 6-foot-6, 318 pound senior offensive tackle transferred to Hahnville as a junior and immediately became one of the team’s most dominant players. Dixon led a line that rushed for more than 5,000 yards and eight yards a carry. He and the Hahnville line were a driving force behind one of the state’s most prolific offenses, one that averaged 37 points per game and scored 74 touchdowns this season. 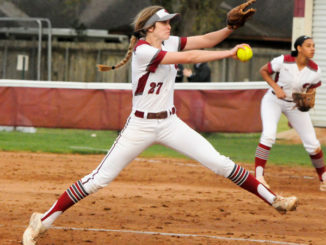 Destrehan, meanwhile, saw its defense evolve into a dominant unit this season. Clark, a senior safety, was a huge part of that. He made 70.5 tackles (58 solo) and four sacks while forcing two fumbles, blocking a kick and intercepting a pass this season, while also making three returns for touchdowns. 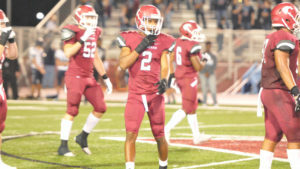 The Tulane signee has played the roles of safety, linebacker, edge rusher and cornerback at different times during his career with the Wildcats, who moved him around to create problems for opposing offenses. Hahnville’s Lyncoy Reynaud was named honorable mention.